If you’re going on a long hiking adventure then you need a daypack that is going to be able to sit comfortably on your back for hours on end. Having a bad daypack can ruin your hiking experience which makes getting the best daypack possible all the more important. 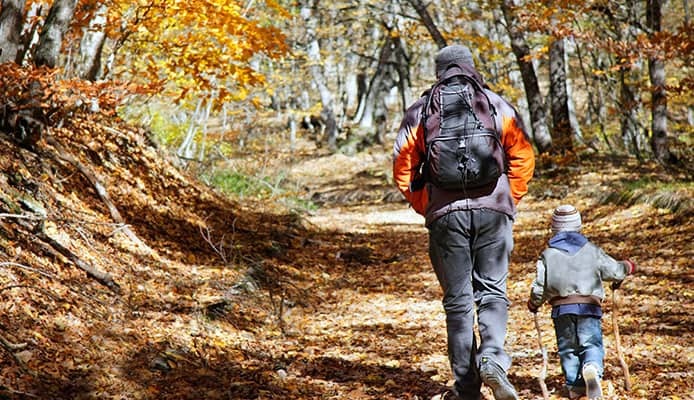 While comfort is a key issue, there are also many factors which make the best hiking daypack including how easy it is to use and whether or not it has enough space to be able to hold everything you need. After that, you also need to consider aspects such as the materials and durability among others. That’s where we can help as we have developed a buying guide to explain all the required features and have also compiled daypack reviews on ten of the best products that are out there to buy. After reading this, you’ll have a clear idea of exactly what type of daypack you want. 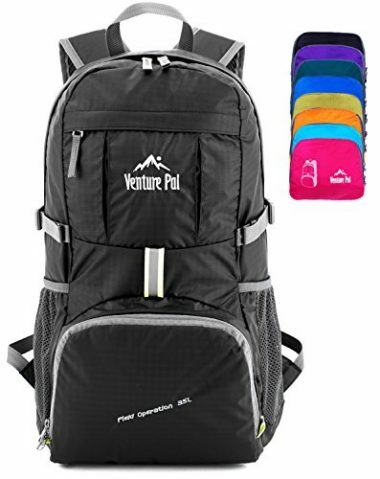 This daypack from Venture Pal is a top rated hiking daypack which has a long list of great reviews from those who have used it. It is one of the best daypacks for hiking as it has everything that you require including a high amount of durability from its tear and water resistant material. It has a double layered bottom and heavy-duty zips too which add to its strength while still being light in weight at just 0.7 pounds. That weight helps to make the daypack very comfortable to wear which is also helped by the breathable mesh shoulders and padded straps, including a chest strap. The daypack also comes in a bright range of colors, which means that you don’t have to stick with the usual black if you wanted something more vibrant. It has multiple different compartments with a large main compartment for all your needs. This is the best daypack for travel which is helped by the fact is can fold down to a pocket size so is easily transported. 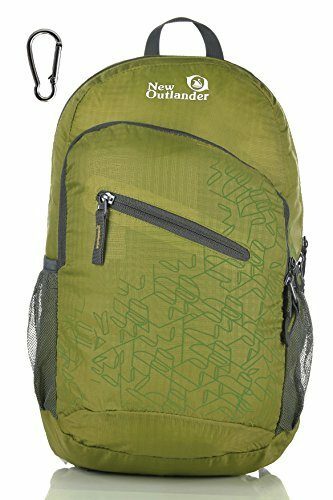 Outlander are another company who have produced a great lightweight daypack as this weighs just half a pound but is still able to hold a large amount of gear and equipment. If you are transporting the bag then it folds down into a very compact size, making it easy to take with you. Despite its light weight and ability to fold down, the daypack is actually very tough and durable. 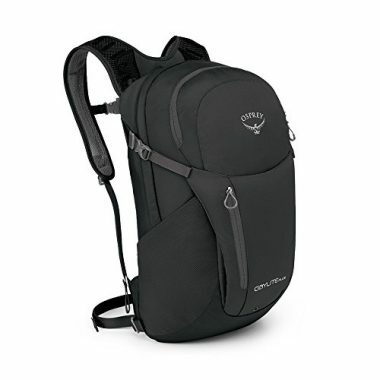 It is water-resistant and made from heavy-duty nylon which adds strength into the stress points of the bag and durable two-way zippers are used too which make this a long-lasting daypack. There are plenty of color options available for you to choose from and the bag has multiple compartments, therefore you have plenty of options and space to be able to store everything that you might need for the day. This is a highly rated daypack and one of the best on the market. 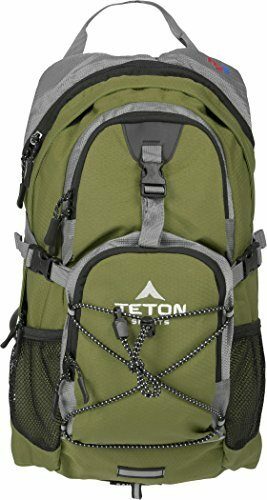 This is one of the best hiking day packs and another which is able to fold down to a very small size to make it extremely easy to carry to wherever you need to go. There is a great range of colors so you are sure to find something to match your style and personality. The daypack is highly durable as it is made from high-quality nylon which is both tear resistant and water resistant too. It has strong metal zippers and there are reinforcements in a number of key positions to ensure that it doesn’t break, which should see this bag lasting for years. The daypack has a 20 liter capacity so there is plenty of room for everything you need but is still have to be light in weight with it being just seven and a half ounces. The bag has breathable mesh shoulder straps and is easy to carry so you can comfortably have it on your back for a whole day. This is a very stylish looking outdoor daypack and another which has been very well reviewed by those who have used it, so you can be confident that you are getting a quality product. This bag has multiple different compartments which are great for those looking for more storage options. It still has a large main compartment and a 24.2 liter capacity but it also features soft pockets which are a great idea for your electronic devices. 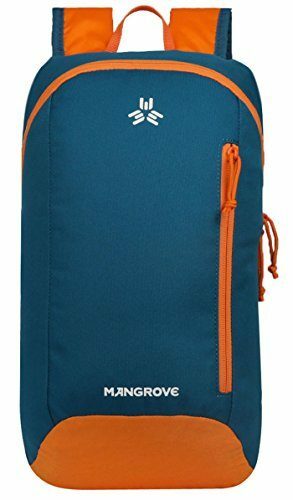 This is a versatile bag and could as easily be used for your morning commute as it could be for a long hike. It is perfect for the great outdoors though with its strong and reliable design which is made from durable polyester and is water resistant with durable buckles and zippers which won’t fail you when you are out and about. The bag is very comfortable to wear which is helped by its adjustable sternum slider. 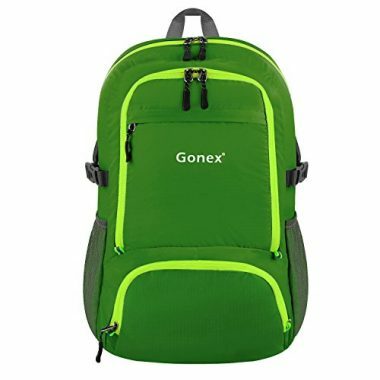 This bag has many features which make it extremely useful for a day of hiking but it also comes in a vibrant range of colors too as you can get it in the usual type of colors of green and black but also blue, yellow and orange. It’s a good looking daypack which will look great on your back. The bag includes a hydration bladder which can store up to two liters and comes with a lightweight, durable and kink-free tube too. The bag is highly adjustable so it will easily fit to your body to make it comfortable for a whole day of sitting on your back. It has a bungee cord system which can give you easy access to large items and has many pockets which will give you easy storage of your items. It has a capacity of 18 liters which should be more than enough for you to be able to store everything that you might need for a day of hiking. This is another stylish looking bag and one that has a 20 liter capacity which is an ideal amount when it comes to hiking, as it will give you enough room for everything that you need while still being able to be comfortable and lightweight when you are taking it around with you. It has a large main compartment and other pocket options for easy storage. It has two mesh pockets on either side of the bag which will be able to add to your storage options and quick access to something like a water bottle. The internal sleeve can be used as a hydration reservoir if you wanted your water that way. It has a mesh-covered back panel which will make the back very comfortable to wear due to the ventilation that it creates. That comfort is added too by the adjustable straps that will be able to secure your bag in multiple different places so it can stay tight to your body. 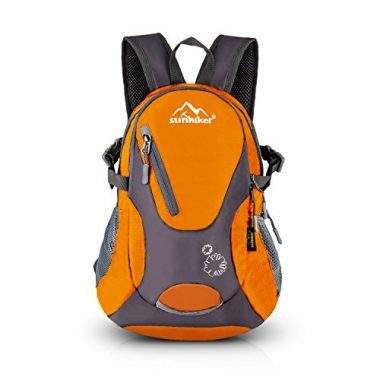 If you’re looking for the best day hiking backpack, then this product from Sunhiker could be the one for you. It is made from a strong nylon material which is tear resistant and highly durable which should make it last for many years but the bag is also water resistant too so it will be able to deal with any accidental contact with the water while you’re out hiking. It features a reflective stripe to help to alert anyone should you ever be in danger and is available in a series of bright colors. The shoulder straps are adjustable to give you a high level of comfort which is helped by the fact that they have a breathable mesh material on them. This bag is going to be suitable for all types of outdoor activities and features many different pocket options, therefore you will easily be able to store away all your required items that you need including mesh pockets on either side which would be ideal to carry a water bottle. 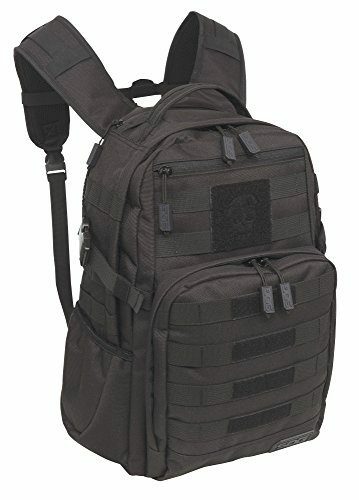 If you’re looking for more size out of your daypack then this could well be the ideal daypack for you as it has a significantly higher capacity than some of the other products on the market with its 30 liters, so you are able to store away many different items for those able to carry a heavy loaded bag. Despite its large size, the bag is still light in weight and will sit comfortably on your shoulders. There are many different compartments available for storage including mesh pockets on either side which will be perfect for being able to store water bottles and other items. The daypack is durable too as it is made from high-quality nylon which will help to prevent any rips from happening and it is also water resistant. Additional strength is provided in weaker areas with durable zippers, therefore this should be a bag that lasts for a very long time. As a complete opposite to the previous product, this is a bag which is going to be ideal for those looking for something a lot smaller and easy to carry as this bag has a 10 liter capacity which will still be able to fit in plenty of items when you are out there on a hike. The bag has a stylish design with a few two-tone color options which all look great. The bag itself is made from a nylon material which is of the highest quality and able to resistant any tears and also water. The thick shoulder straps give it a lot of comfort for all-day wear. The daypack has two main compartments for easy storage but access to other compartments too so you are able to separate your items and make the most important things the easiest to reach. This is a highly rated bag and a perfect option for anyone looking for something a bit smaller. 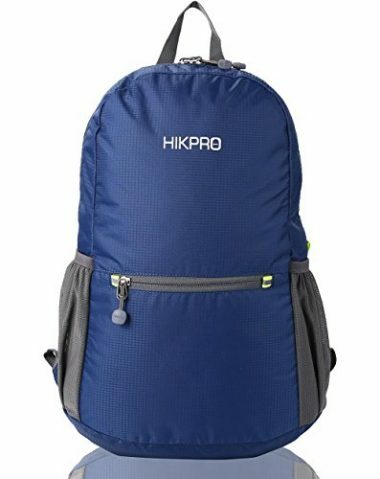 This is a larger bag from Hikpro and one which is actually available in three different sizes depending on your needs and how many items you need to be carrying. The three different options are all large in size as you can get it in 25, 33, or 35 liters depending on your preference. It ranks very highly in durability with its tough nylon material which will be able to resistant any tears and water while also having an abrasion resistant metal zipper. The double fabric bottom of the bag will help to give it additional security so you know that it’s going to last. The bag is also very comfortable to carry with its wide breathable mesh straps which will be able to hold a lot of weight and still give you comfort throughout the day. There are many different zipped compartments to keep everything organized and this is an overall brilliant daypack. When it comes to what’s important for you in a daypack, then the size is going to be right up there at the top of the list. Getting the wrong size can lead to an uncomfortable or frustrating experience as you can either get one which is going to be too big for you to carry or one that is not going to be big enough to put all of your items in. In terms of a standard size, a 20 liter daypack be the most common that you will find as this is a reasonable size which strikes a balance between your levels of comfort and making sure that you have enough room to be able to take what you need. 20 liters is still a lot of space but its level of comfort will obviously be also affected by what you are putting into the bag. If you wanted to have something that was a bit lighter then there are other bags available such as a 10 liter bag which has a much smaller profile and will fit more snuggly over your shoulders, especially if you’re more petite. This is where your body size can play an important factor in determining the best bag for you as if you are more slender then sacrificing a bit of space for that additional comfort might be the best way to go. If you are looking at having a smaller bag then it might be a good idea to pre-plan what you will be planning to take on your day trip so you are able to be confident in knowing that your bag is going to be able to fit everything that you need it to. Other compartments can be very useful in regards to having that extra storage. On the other side of things, it could be that you need a much bigger bag and we have options here that go up to 35 liters. A fully stocked 35 liter bag could get very heavy so you would want to ensure that you are going to be strong enough to be able to carry it for long distances. With bags this size it’s important to look for additional straps which will help to distribute the weight and these can often be found on the sternum and/or waist. If you get the size of your bag wrong then it could well lead to negative consequences either way and you could instantly regret your decision to buy it. That is why It’s vital that you choose the right one for you so you are able to travel in comfort. The weight of your bag can be important but this also depends on what you are planning to do with it and what you are intending to carry. If you are ultralight backpacking, for example, then this is going to be more of an issue than most other circumstances. A lot of these bags are able to fold down into a very small size so they can be put away and easily stored. If you are going on a vacation and are planning on hiking while you are there, then this would be perfect as you would be able to take it in a larger bag with you due to its size and weight, and then unfold it when you get to your destination. In circumstances such as this it can be a good idea to get one which is light so that it’s as portable as possible. In terms of how heavy it’s going to be on your shoulders though, that’s not really something that you need to be worrying about as there are going to be other factors involved. If you are stacking up your bag with a lot of different items when that weight is going to build up into something significant as the weight of all the individual pieces of gear add up. In this situation the weight of the bag itself isn’t really going to be an issue as it’s only going to be a fraction of the overall packed weight. The importance of the weight therefore is relative to your situation. You just need to work out how important it’s going to be for your situation and then get a daypack which is going to match your needs to ensure that you get exactly what you’re looking for. If you’re going to be wearing something for a whole day then it’s vital that it’s going to be comfortable enough to wear for those long periods. If you have a bag that is uncomfortable it can easily ruin your trip and turn your hike into a nightmare. There are a few key features when it comes to these daypacks which can have a large impact when it comes to overall comfort. Perhaps the best place to start would be with the shoulder straps of the bag as these are going to be the main point of focus in terms of carrying the weight of the daypack. It’s important that the shoulder straps are both padded and breathable so that the strap doesn’t dig into you and it doesn’t make you too warm. Load lifters are also a good feature as these are straps which connect to the top of the bag to pull it back towards the body, keeping the weight close to you and reducing any movement. In terms of the back of the daypack it’s also a good idea to have additional support at the lower back area in the form of additional padding, as this will not only help to support the weight of the bag but it will also let air circulate to prevent you from sweating. Another area which should be padded is the waist belt as this plays a crucial role in securing the bag to you and preventing any movement. Straps across the front of your body aren’t seen in all forms of backpack but they are increasingly important the heavier the bag gets, as they are able to transfer the load of the weight, keep the weight of the bag close to you and also minimize any movement that it may have. Another good place to have a strap is on the sternum, which is across your chest. Again, the reason for this is to decrease any movement in order to make your bag more stable but this can obviously present a problem for women. If a bag has a sternum strap and you feel that this may be a problem you need to check whether it can be set high enough to not be an issue or if it will work without it. Finally, another feature that some bags have when it comes to comfort is a torso length adjustment which will let you set the perfect height for your shoulder straps so that you can make the daypack individual to your needs. All these features play their role in ensuring that you have a comfortable journey with your daypack. If you are going to be traveling for a long time then bag security might become an important issue for you. Unfortunately some people can’t be trusted and if you’re staying in a city, for example, then you don’t want to have to take your bag absolutely everywhere with you. While there are some great anti-theft bags out there, it is an extreme step to take and most thefts that happen when it comes to backpacks are very opportunistic where they see a quick opportunity and take it as soon as they can. Due to this it’s a good idea to have a double zipper as you would be able to lock the two together in order to prevent anyone from getting close to your items. This will help to perturb any potential thief long enough to move on and away from your bag. The most common material when it comes to these daypacks is nylon as that is a strong material which is also going to be light too. 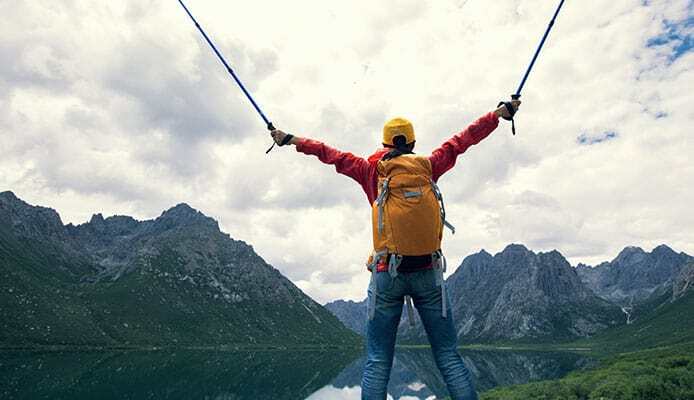 It’s a common material when it comes to many outdoor products but it’s also one which can be strengthened to make it even more resistant to the types of stresses and strains that can happen with such a bag. Another material that is widely used is polyester which has many of the same qualities as nylon when it comes to what it can offer with a daypack like this. There are two important aspects that you want the material to be, however, with the first one being its ability to resist water. It’s hard to find any bag that will be waterproof as the zips will often compromise that but you want a daypack which is going to keep your contents dry if you go through a spell of rain. As well as being resistant to water it is also useful for them to be resistant to tears as that is always a hazard when you are outdoors. You might also be dealing with sharp objects such as multi-tools or camping knives too which is why you want a daypack which is going to be able to cope with any accidents. There are a few other considerations when it comes to materials too as many daypacks will have particular weak points which take on stress more than other parts of the bag. Having additional material on these areas is a good idea as it will help to ensure that the bag doesn’t rip at all so that it can last you for many years and it is also a good idea to have thicker material on the bottom of the bag too, as this is the area which will take the largest amount of punishment. All of these bags that we mentioned have one large compartment where you are going to be able to store the vast majority of your gear. Having one compartment can make things easy as you can just throw them in there but then difficulties can arise when it comes to more delicate or smaller items which can get lost in the space. This can lead to a very frustrating search through your bag which you want to avoid. Therefore to go with the main compartment, you ideally want a few other options when it comes to your daypack with one of those being a top pocket. This is a really useful space to be able to grab valuables and small items such as your keys and phone. This will help to keep them separate from all your other items and in each reach at all times. Front pockets can also be a be an important addition as this will simply give you space to place items which you might use a lot more often or smaller items that you don’t want to get lost. Some of them will come with inner internal pockets which add to the number of storage options that you can have. Most daypacks will also come with external pockets on the side which are usually made out of mesh. It’s pretty obvious what these are for and that if for storing water bottles so you have easy access to them and you don’t have to store them in your bag with your dry items. These pockets can obviously be used for whatever you want but they are designed to hold bottles. Some bags will also have come with other types of smaller pockets too such as hip belt pockets which can be useful for storing items that you often have in your hands such as a flashlight, phone or a compass. It means that you are able to grab those types of items without having to take off your daypack or having someone else get them for you. The amount of compartments that you need is obviously up to you and how you plan on organizing your trip away. It’s a good idea to plan ahead and think about what is going to be in each section. This way you’ll know what compartments you need and how important they are. There is little point in getting a daypack that is going to be difficult to use. It should be there as your friend when you are on a journey and there to provide you with everything that you need and in an easy to use and convenient way. 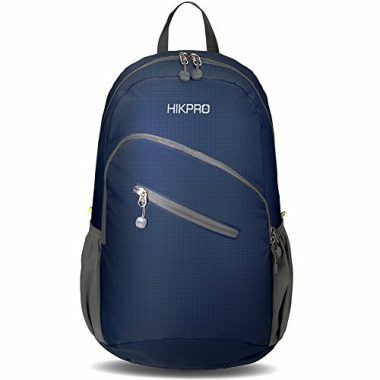 With these backpacks, there are many different types of features that they have but not all bags have them so you need to see which ones are going to be most important to you and which of them you could happily live without. Hydration pocket – It may be that you just prefer to carry water bottles but having a hydration pocket where you can keep a reservoir of water can be very useful in providing you a constant source of water and one that you can easily drink without reaching into your bag. Some bags are completely set up for this whereas other have pockets which will be able to do the job. You need to be able to look for a bag which has a port where you will be able to feed a hose through. With the hose, it’s also useful for it to have a clip so it’s not constantly flapping about behind you. Top handle – It seems an obvious thing to say but it’s easy to underestimate how often you will use the top handle of your bag. It’s useful not for only picking up your bag but also hanging it up too and it’s something that you will use time and time again. It only has to be very small but it’s an important detail so just check that your bag has one. Zipper ties – These can be a great part of a bag but if you don’t have any then you will be able to make your own so you don’t need to worry too much. If you’ve ever tried to open up a small zipper with either cold hands or gloved hands then you will know how difficult it can be. Using zipper ties will help take the stress out of it and give you something to hold on to. Waterproof cover – This is an important feature to have if you are going to be anywhere where there might be persistent or heavy rain. Some daypacks will come with their own water cover but most don’t so you need to assess how important it’s going to be for you. You should make sure that your daypack is water resistant but that only covers so much before the rain creeps in so getting a water cover could be very important. Compression straps – Any movement that is in your bag can cause momentum shifts that you have to fight against in order to keep the daypack on your back. That’s the reason why you want to make sure that the daypack is strapped up close to your body but it’s also the reason that compression straps can be so useful. If you haven’t got a full load they will help to keep everything tight and compact. Loops – Having loops can be important for a few different reasons. It can be a very easy place in which to store any gear which you either want easy access to or it might be too big for your bag such as a helmet. They allow you to create easy external storage. Another loop which can come in useful is a trekking pole loop which will be able to store your trekking pole when it’s not in use, if you use one. With these types of equipment it’s always important to make sure that they are durable as they should be able to last for many years with repeated use. Making sure that they are made out of the strongest materials is a good starting point which includes checking to see if the material will protect against rips and water. Having a true scope of durability can be difficult to gauge as it requires years of use but you can get a very good idea for it through the build quality and the construction of the daypack. This is also where it’s very useful to look at the user reviews to see what people are saying about the products durability. As we mentioned before, it’s also important that a daypack places added strength on its weak points so that they don’t break easily when placed under the stress of a heavy load. This added strength should also apply to the whole bottom of the daypack was this is where it is most likely to have holes and rips. Before you jump in and buy a daypack it’s important to make sure that you are getting the right type of backpack for your situation. Daypacks are perfect for being able to go out for a day of hiking or for traveling around but that might not be exactly what you are after. If you’re hiking then one of your group having a backpack cooler can be a great idea as you’d be able to get cold drinks or food at all times of the day. It’s a great product which can vastly improve your enjoyment of a hike. It could be though that you are going to be on or near water and were hoping for something which was going to be able to give you more protection such as a waterproof backpack in order to keep your contents dry, a more extreme option would be to look for a dry bag which will be able to offer complete protection and can often be submerged. Also if you are fishing then you could want to get a backpack which is specific to your activity rather than just get something which is going to be of general use. Whatever activity you plan to be doing, it’s important to get a backpack that is going to match it. If you had a daypack flush to your body then it could quickly cause an uncomfortable amount of sweating but more importantly, cause your body to overheat which would be very dangerous. That’s why it’s important for your daypack to have ventilation in order to stop you having to take it off to cool down. The point where your back meets the daypack is a great place to have ventilation which will ensure that there is a layer of air and circulation between you and the backpack. This ventilation may also extend out to the padding that is around your shoulders and also around the other areas of your body too. This is not as important as having the ventilation on your back and as a whole this is less of an issue if you are going to be in a colder climate where your body isn’t going to overheat. Ventilation is always useful to have on any form of backpack. Q: What Is A Daypack? A: As the name implies, a daypack is designed to be able to store a day’s worth of gear so you are able to enjoy a day out and have everything that you need to hand without having to carry absolutely everything that you own. If you are going on a longer adventure then you would need a larger backpack but this is ideal for those types of situations where you have a permanent camp that you will be coming back to and want to be able to go for a long hike. They are also great for travel too as well as other uses such as climbing or even just commuting. They are usually in a very handy size and are easy to carry. They can have multiple uses but are primarily designed for people to be able to take a lighter load on their back. Q: Why Do I Need A Daypack? A: A daypack is going to be a great way to store your items in an easy to carry way to enjoy whatever activity you are doing. They will be able to fit tight to your body and allow you to travel long distances with them on your back. 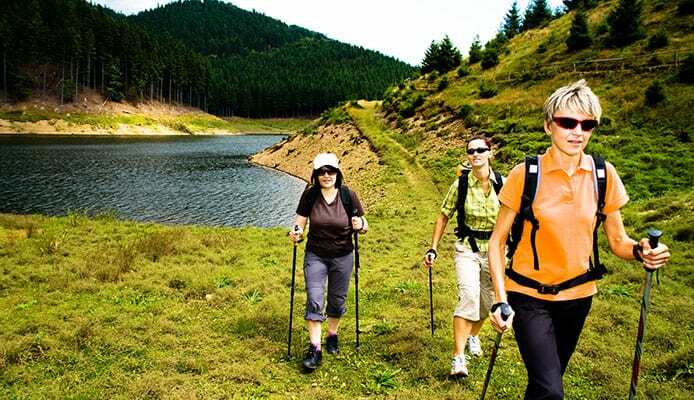 The primary use that they tend to be bought for is hiking as they make it very easy to store all the essential gear that you might need with their large compartment and small convenient compartments where you are able to store other items. If you have multiple pieces of gear and need to transport them then carrying them on a bad around your shoulders is the tried and trusted way of going so. If that gear is going to fit into a bag with a capacity of around 20 liters then a daypack would be perfect for you and you can also get it a little bigger or a little smaller. A daypack can be a great way to travel about as it is able to put all of your items into one easy to use and convenient bag which will fit tightly onto your body and enable you to head off on your adventure without having to worry about not having everything that you need. In order to choose the best hiking daypack though there are a lot of things to consider with size being at the top of the list. Most of these products come in a size of 20 liters which is ideal for a day of hiking. It could be though that you don’t need a lot of items and need a 10 liter bag or it could be that you are carrying for your children and require something like a 30 liter bag. Some of these bags are able to fold down to a small size which makes them very easy to transport while others have much more of a traditional backpack look to them. The comfort of the bag is a very important factor as if you’re going to be out for the whole day you don’t want something which is going to be highly uncomfortable to carry. In terms of the materials of the product you just want to ensure that they are high quality and have the ability to resist and tears or water splashes that might happen. While you will want a large main compartment, it’s very useful to have multiple different compartments where you will be able to store valuables, essentials and smaller items so they don’t ever get lost. It’s also important to look for key features which are going to make the daypack easy to use, such as a grab handle and loops, this is often a matter of choice and personal preference though so it often depends on your needs. Durability is a key issue when it comes to any form of backpacks as you want to make sure that it will last you for years. In this respect, reinforcements in weak areas and the bottom of the bag is essential. After that you want to look for a bag that is well ventilated if you are going to be in warmer climates. There is certainly a lot to think about but hopefully this guide has been able to answer all your questions so you will have a mind full of information when it comes to daypacks. Now you have this information you’ll be able to pick the perfect daypack for you and head out there knowing that your hike is going to be more prepared and comfortable than ever.